Is there any way to determine if a strategy saved offline on a computer matches the strategy running on a SNAP-PAC-R2? I have been playing with a unit that we purchased as a spare part and noticed that if I attempt to go into Debug mode that it will prompt me to download unless the offline strategy matches. Is this a valid way to determine this? Is there a better way? 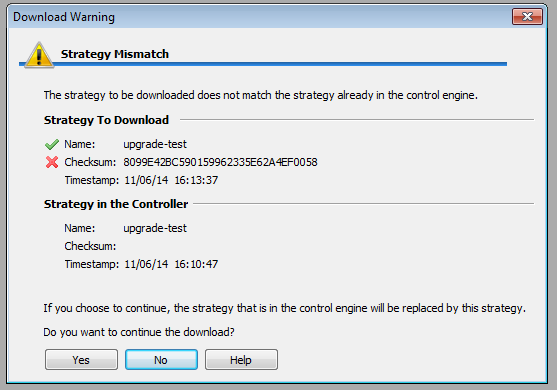 If I open an archive saved with PAC Control version R8.2a with PAC Control version R9.4a, will this still be a valid way to determine if the strategy matches or will the process of converting from R8.2a to R9.4a flag the strategy as different? Welcome to the OptoForums! The best way to make sure the strategy you’re working on it’s what’s in the controller is by uploading the archive in the controller – assuming you have it down there. See this post about archiving (and making sense of a pre-existing strategy).